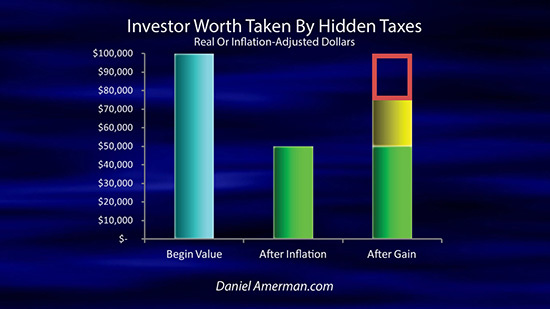 What if there were a hidden tax that most investors were simply unaware of? 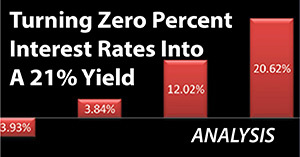 A tax that could take what looks like a 100% gain - and turn it into a 25% loss? 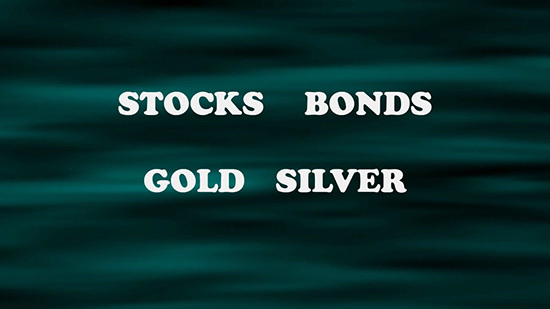 What if this tax applied to stocks and bonds, as well as gold & silver? As we will explore using an easy to follow example, this hidden tax does exist, and you have likely been paying it for many years without realizing you were doing so. To see how this could be, let's consider two investors, Kate and Jack. 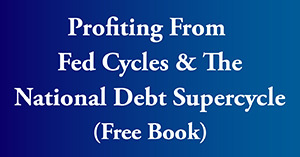 Kate decides to play it safe in the current market environment, and she moves her money into a $100,000 insured account at her bank, at an effectively zero percent interest rate. Because she neither gains nor loses money, there are no tax consequences. 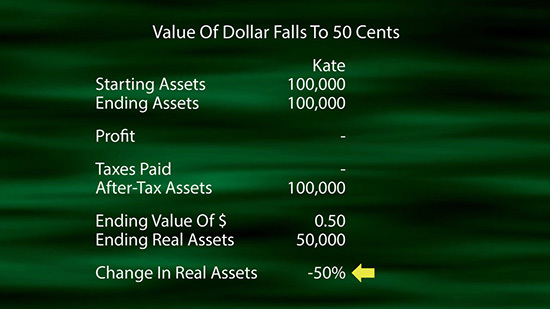 So if we look at this visually, and in the way most people look at the world, which is a dollar simply being a dollar with no adjustments, then Kate started with $100,000 and she ended with $100,000, and nothing changed. 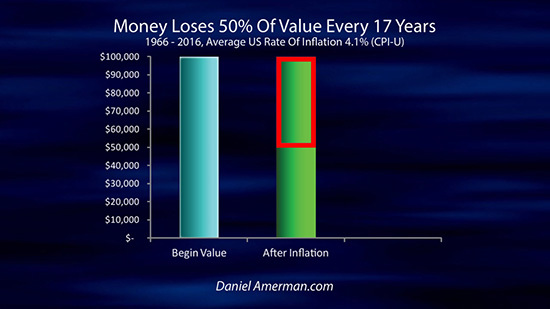 Let's add an assumption, which is that 50% of the value of the dollar has been destroyed by inflation. Now, that probably seems like quite an assumption - how could this happen? Let's consider a couple of possibilities. There could be a crisis, or monetary event of some kind, and in this kind of scenario a dollar could become worth fifty cents quite quickly. There is another way of looking at this, and that is to just look at history and the passage of time. This is what a dollar would have purchased in 1966. Fifty years later, we take a look at the same number of dollars, and then look at what those dollars will buy in 2016. Eighty-six percent of the value of the dollar has been lost to inflation, leaving only 14 cents in purchasing power. This is based upon using the Consumer Price Index as an inflation measure, with source of the numbers being the US Bureau of Labor Statistics. Another way of looking at this is that the average inflation rate over the period between 1966 and 2016 was 4.1%. 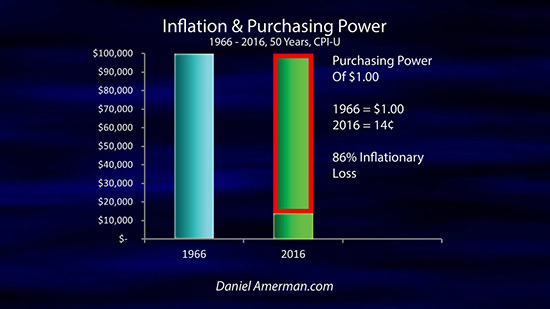 If we look at what a 4.1% inflation rate does to purchasing power, it cuts the value of the dollar in half about once every 17 years, on average. So even if there were no crisis and the last fifty years were to just repeat themselves, then on average, we would still expect to lose half of our purchasing power over about the next 17 years, and then half of what remains in the next 17 years, and so forth. So there is really nothing radical at all about assuming that the dollar loses half of its value, it is in fact just the opposite. Creating an annual rate of inflation is an open and explicit matter of governmental policy around the world, and this has been true in the United States since the 1930s. Unless there are major changes in policies by the Federal Reserve, then losing half of the value of the dollar, and then doing it again, and then doing it again, is more or less guaranteed as a matter of policy. 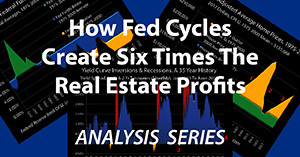 The only questions are how long each cycle takes. Does the Fed generally maintain control over inflation, and does it take 15 or 20 years? 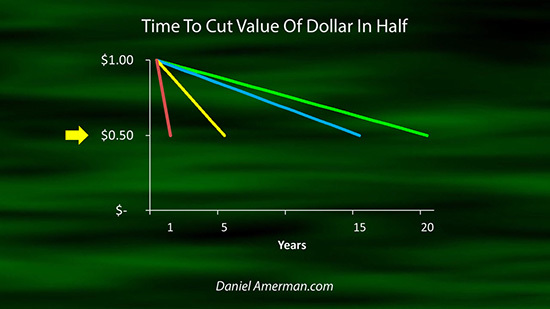 Or does the Fed lose control, and does it only take 5 years - or even 1 year - for the dollar to lose half its value? The destination itself is not in question, the only question is the time it takes to get there. 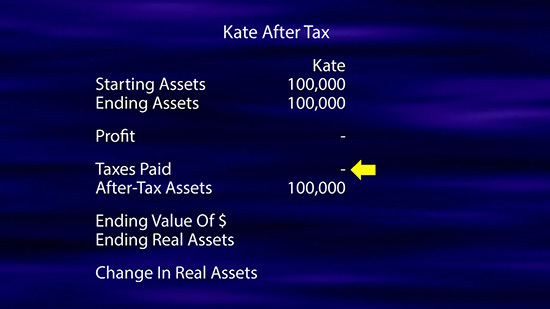 Whether it happened very quickly in some form of monetary crisis, or whether it happened over 15 to 20 years in just the normal course of things, either way the purchasing power of Kate's $100,000 has been cut in half, which we can see with that glowing red box. And when we subtract that loss in purchasing power, we get ending inflation-adjusted dollars, which is $50,000. And we can see this numerically when we move back to our table. 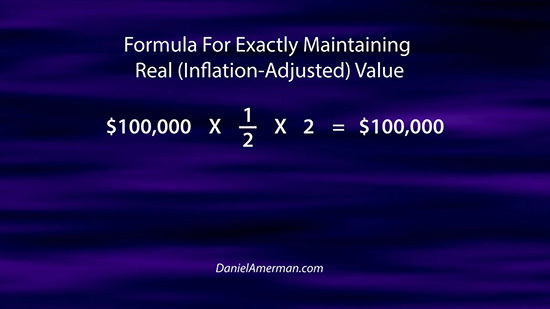 We look at the value of the dollar, we multiply it times the number of dollars, and we get $50,000 in inflation-adjusted dollars, which is what economists call "real" dollars, and that is a loss of 50%. Our other investor, Jack, is quite different from Kate. Like most people, Kate almost never thinks about inflation or possible monetary crises. Jack, however, thinks about these things on a regular basis. 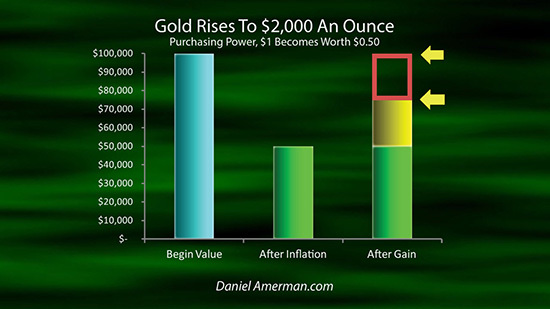 So to maintain the value of his savings, to maintain his purchasing power, Jack buys gold. 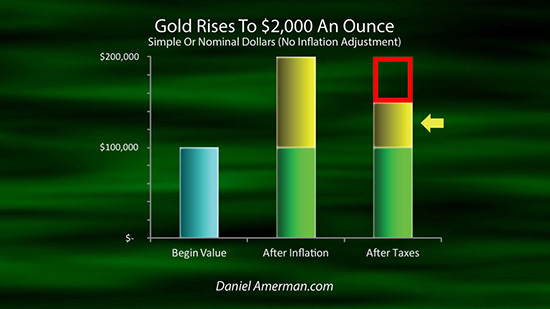 Now, gold is very good way to simply illustrate this hidden tax, but keep in mind that this also applies to stocks, bonds, and almost any other way we save or invest money. We are going to assume that with his $100,000 Jack purchases 100 ounces of gold at a price of $1,000 per ounce. Of course, that is not the actual price of gold today, but using round numbers does make this much easier to follow. 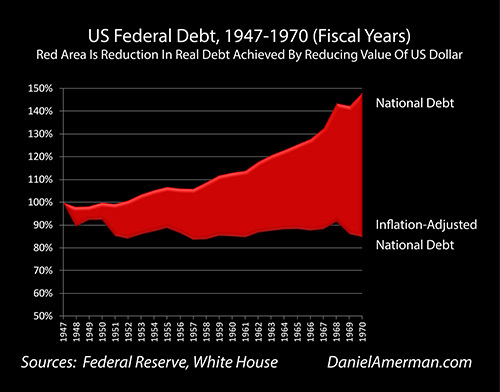 Now, let's return to our visual look, and keep it in inflation-adjusted or real dollars. Just like Kate, Jack started with $100,000. And if we look at the situation in inflation-adjusted terms, if Jack had kept his savings in cash, then he would have lost the 50% in value, and he would only have an ending purchasing power of $50,000. 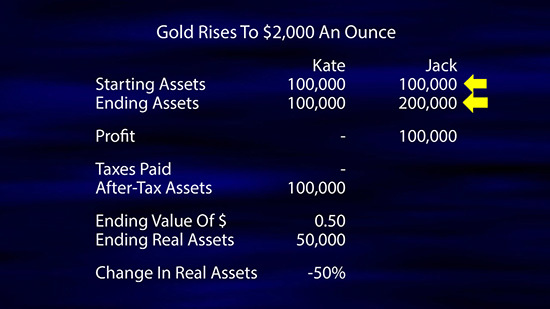 But in Jack's case, he owned gold, and we are going to assume that gold acts a perfect inflation hedge, or perfect form of money, meaning that it exactly maintains its purchasing power regardless of the rate of inflation. Visually, for this to happen, another block has to be stacked on top. Jack started with blue block, it got knocked down by inflation to the size of the green block, and to be kept whole, to perfectly maintain purchasing power, we have to stack the yellow block on top of the green block. And how tall does that yellow block need to be? Here, is the general form of the equation if you want to pause the video and look at it, but it is much simpler to just use our round number example. If we start with $100,000, and we want to end up with the same $100,000 in purchasing power, and the value of the dollar drops in half, then there is only one way to make those numbers work. 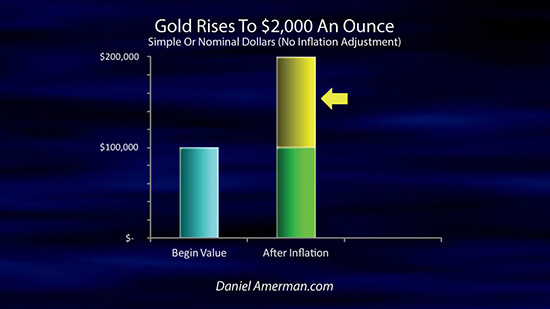 We have to multiply the price of gold by two, and the price for gold has to go from $1,000 an ounce to $2,000 an ounce. Or simplified and restated, one half times two equals one, they drop out, and we are left with our ending purchasing power equaling our starting purchasing power - simple, basic and irrefutable. This is true over short periods of time, and it is equally true over long periods of time. Now, this is the situation in inflation-adjusted terms, but Jack probably isn't thinking about it that way. Even with his awareness of inflation, most of the time Jack is probably doing what most of us do, and thinking just about simple dollars. And if we look at the table, Jack sees that he doubled his money, from $100,000 to $200,000. Wow, that's nice. And when we look at the situation visually, looking just at simple dollars, Jack didn't lose anything. The ending green box is the same size as the starting blue box, the original $100,000 is still there, and we have stacked another $100,000 yellow box on top, to show the doubling of our money. I don't know about you, but most of us get pretty happy when we double our money. That could even call for a reward or something. So whether to buy something nice, or just to lock in his gains, Jack sells his gold for $200,000, which generates a $100,000 profit. Now, someone besides Jack is keenly interested in that profit, and that would be the United States government, or more particularly, the Internal Revenue Service. 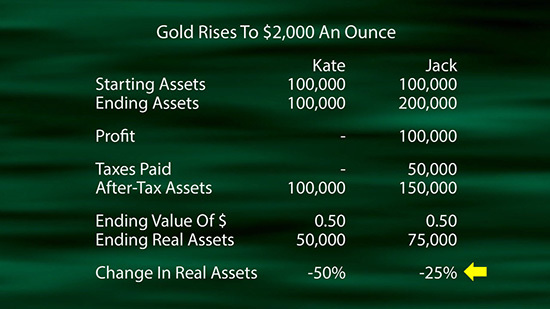 For illustration purposes and to keep the example numbers nice and round and easy to follow, we will assume a 50% future combined capital gains tax rate on gold. So for Jack, paying a 50% tax rate on $100,000 in profits means $50,000 in required tax payments, and subtracting those taxes leaves Jack with $150,000. Now, in simple dollars, this is not so bad, it is just the way of the world. The government took a big chunk of the profits, but Jack is still ahead by $50,000. Our final step is to adjust for a dollar being worth 50 cents. Remember we, needed the full yellow block to stay even for inflation. But we lost half of it to taxes. Half of 50% is 25%, we are down by 25%, we did not stay even but lost 25%. Another path, is to start with $200,000 in the table, subtract $50,000 for taxes, multiply the remaining, $150,000 by 50% for our adjustment for purchasing power, and we find that Jack's net worth after-inflation and after-tax has fallen to $75,000. 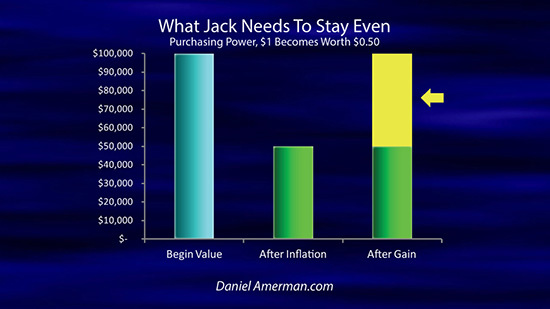 When it comes to what matters, the purchasing power of what our money will buy for us, then Jack didn’t double his money, instead he lost a quarter of what he started with. Jack just met what economists refer to as “inflation taxes”. And these taxes ran him over. He had no income, not in real terms, instead he was faced with trying to overcome a loss that the government was forcing on him. And because the government taxed him on his attempt to just break even on the value of his savings, he was unable to do so. 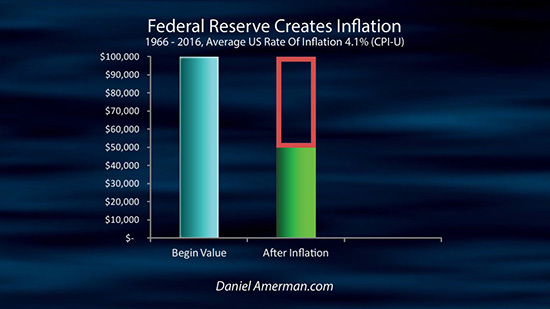 1) One branch of the government, the Federal Reserve, quite deliberately and openly creates inflation and decreases the value of our money every year through its monetary policies. 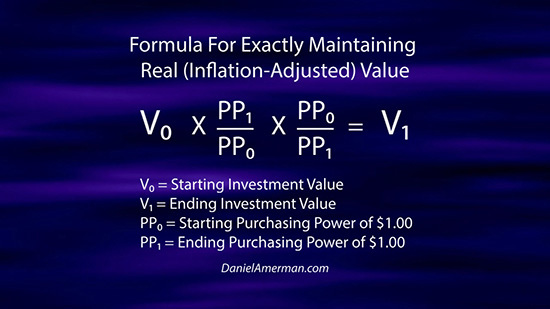 2) The only way for a saver or investor to break even and maintain purchasing power, is to earn at least enough money to offset the amount by which the Federal Reserve is reducing the value of their money. 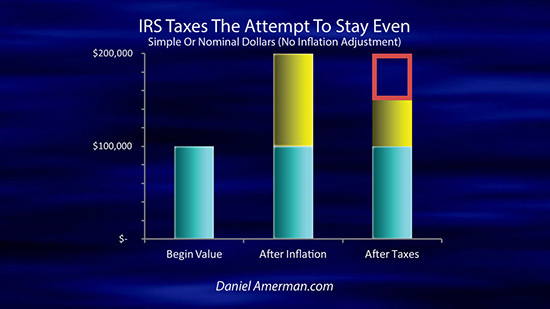 3) Another branch of the government, the Internal Revenue Service, does not recognize the existence of inflation, but taxes all gains in simple dollar terms, which means it taxes any attempts to simply maintain the value of our savings. This is lucratively profitable for the government, but makes it much more difficult to just hold on to what we have, let alone genuinely get ahead. 1-2-3, these all exist, there is no question about any of them. 1-2-3, inflation taxes are absolutely real. 1-2-3, if you have savings or investments, then you've been paying inflation taxes, whether you know it or not, and you are likely to continue to do so. Well, let's consider a heavily indebted government, like the United States. 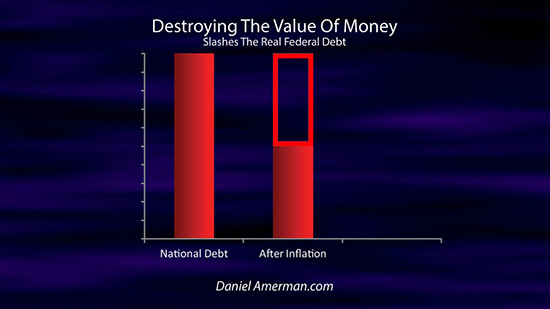 If the purchasing power of savings is cut in half - then so is the real value of the national debt. It is gone. 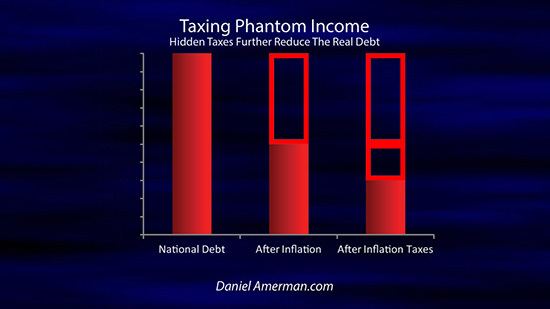 And if huge, artificial taxes on phantom income are collected as part of the process, then those additional tax dollars allow even more of the national debt to be paid down. Isn't that interesting? 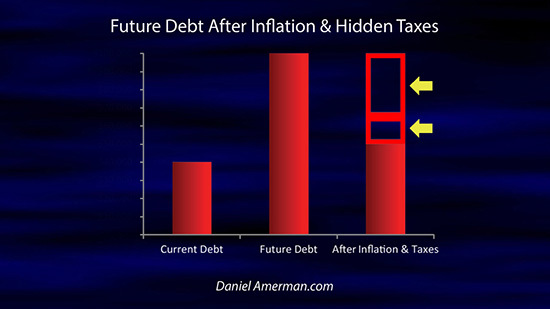 Another way of looking at this is that even if the debt isn't paid down, the 1-2 combination of inflation and inflation taxes at least greatly reduces the rate of growth in the national debt. Relatively few people are aware of inflation taxes, but hopefully after watching this financial education video, you are aware, even if you were not before. There is a real problem here, and to solve a problem, we need to first understand the problem. In the next video, we will examine something about inflation taxes that seems upside down. And that is how the more we make, the more the government takes, and the less we end up having. 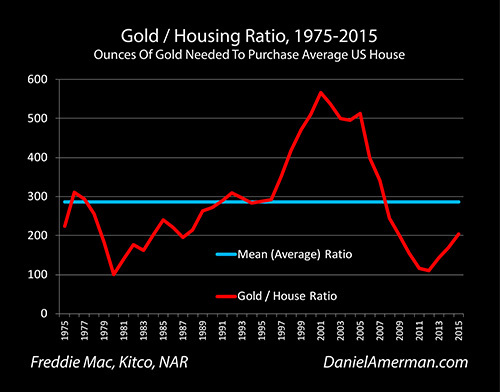 Over the last forty years, the Gold/Housing ratio has been a quite useful measure for evaluating relative values between real estate and gold. As explored in the analysis linked here, this ratio also has an interesting historical track record for identifying turning points in long-term gold price trends. 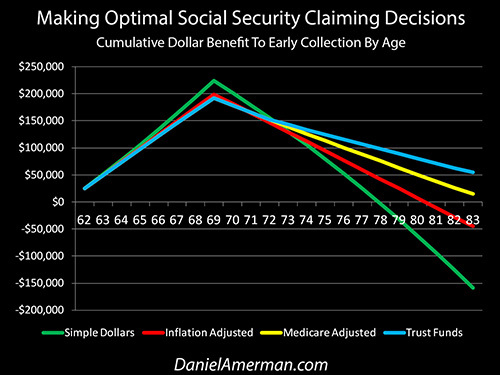 How tax rates are presented to the public can be quite different from how they really work – and the same is true of Social Security. 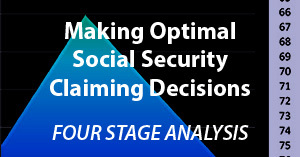 The government strongly encourages people to wait as long as possible before collecting their retirement benefits – but as explored here, is that truly in your best interest, or are a few factors being left out?